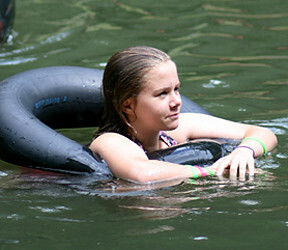 Drama is a big part of life a Rockbrook for our campers. 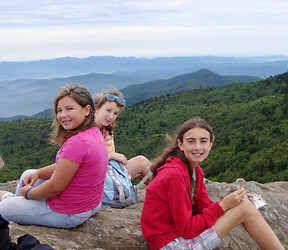 Each day there is a regular drama activity where girls play acting games, learn drama skills, and practice improv techniques. The highlight of every drama camp session is the full musical performed for the whole camp. Every girl can be cast to speaking, dancing or singing parts, while others may chose to work on the play production in costume or set design. This afternoon the entire camp, plus a few of the invited parents of girls performing, gathered for a special event in the gym, which, like last night’s banquet, was the culmination of creativity and hard work spread over many days during the session. It was this session’s musical, Willy Wonka JR! Throughout the session the cast members have been learning songs, rehearsing choreographed dances, and memorizing lines for the main characters in this well-known story of Charlie and his quest for a golden ticket to tour the Willy Wonka Chocolate Factory. We had campers of all ages playing the main parts: Willy Wonka, Charlie, Grandpa Joe, Augustus Gloop, Veruca Salt, Violet Beauregarde, Mike Teevee, and an entire crew of Oompa-Loompas complete with orange skin and green hair. The songs were wonderful too— “Cheer Up Charlie,” “Pure Imagination” and the “Candyman,” standing out as favorites. Watching the performance, I could really tell the girls were enjoying themselves. Thanks to everyone, particularly the drama instructors, for making it an enjoyable afternoon for everyone! 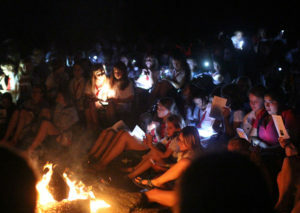 We closed the day, and the session, tonight as Rockbrook girls have closed their session every summer since the camp was founded in 1921— with a special campfire we call our “Spirit Fire.” Different from the zany exuberance we’re more accustomed to around here, this is a chance to slow down a little, clean up a little (We wear our “whities” uniforms.) and enjoy a campfire together paying tribute to the experiences we’ve shared, the deep relationships we’ve formed, and the personal strides we’ve made together at camp. 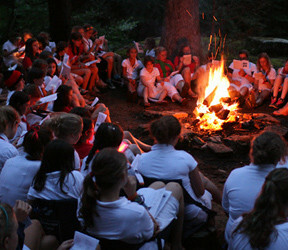 The scene is beautiful— counselors and campers gathered around the fire, squished shoulder-to-shoulder, maybe sitting on a welcome lap, inching as close as possible together, stars and tall oaks high above, crickets chittering about, all glowing a dim orange from the fire and nestled in the woods we have come to know and love so well. Adding to this are the traditional songs sung as part of the Spirit Fire program. Here’s a 1-minute recording of a song from last night. 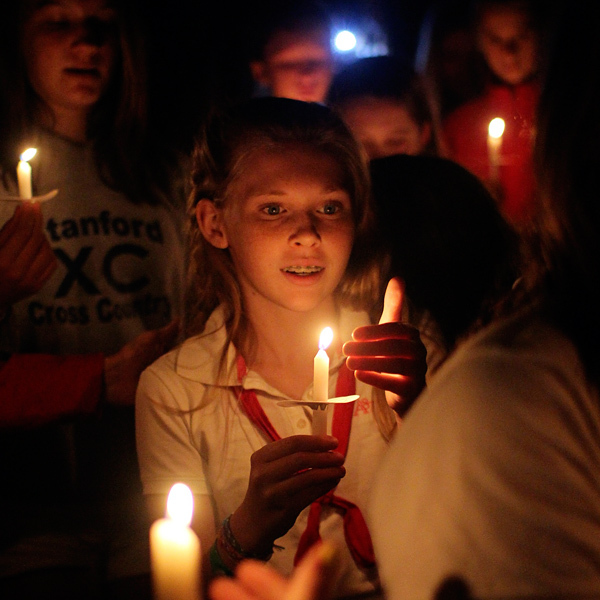 The program also included campers and counselors from each age group presenting short speeches summarizing how they feel about Rockbrook and relating what they’ve learned during the session. Sarah also spoke, tonight giving everyone a challenge to enliven their “Rockbrook Spirit,” their kindness and generosity of attitude, their authentic selves, back home and at school. We closed the Spirit Fire with everyone lighting their own small white candle and forming a row around the lake, singing softly. With the water reflecting candlelight back onto everyone’s faces, surrounded by all these friends, and filled with so many great memories from the last few weeks together, this was an emotional, beautiful moment. I can’t think of a better way to mark the great camp session we’ve had together. OK. So you’ve always thought it would be fun to act… perform a short scene, maybe create a character or personality, develop a story line. You’re a secret performer at heart. Sure, but the problem is, when do you do it? Who’s going to be watching? What will people think if suddenly you turn into a sweet old lady, or a glamorous Hollywood starlet, or a cranky bus driver? 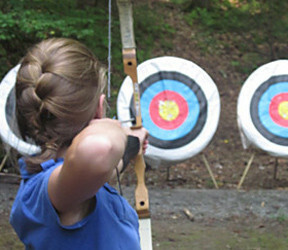 That’s another fun thing about camp; there’s plenty of chances for acting. In addition to the Drama activity that meets most every day, you can join the group of girls producing the end-of-session musical (Did I mention singing too?). Also, some of the evening program activities provide opportunities to perform for your friends. A great example of this is “Fractured Fairy Tales,” a fun game where each cabin of girls presents a skit combining more than one classic fairy tale. Can you imagine Little Red Riding Hood and the Three Little Pigs in the same story? Needless to say, it can be pretty funny. 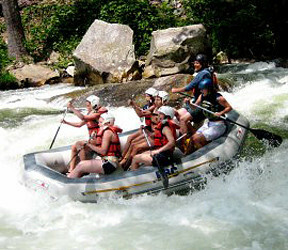 Each cabin takes a turn performing its skit. With so many characters, everyone plays a part. It’s also fun to watch the other skits when its not your cabin’s turn. 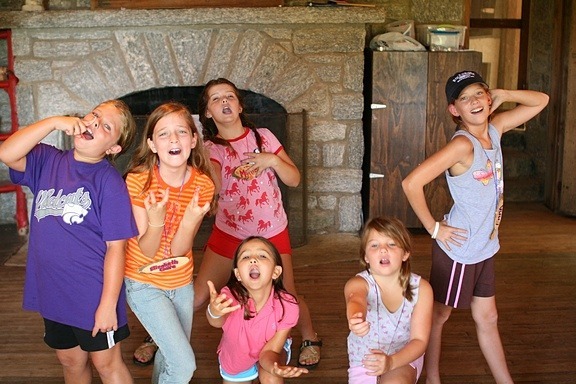 Once you try acting at camp, it could become one of your favorite things to do! 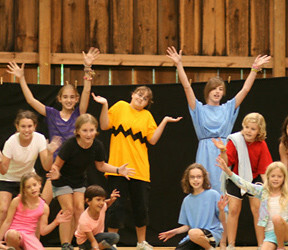 This past summer our camp drama production was You’re a Good Man Charlie Brown. Based on the popular Broadway musical comedy, this “kids version” of the play still has great music, singing, and story lines. It of course features many of the characters made famous by cartoonist Charles M. Schulz in his comic strip Peanuts. There’s Snoopy and his doghouse, Linus and his blanket, and Lucy and her “psychiatrist” stand. In the story, Charlie Brown hopes to discover what it means to be a “good man,” and in the end, after many challenges and setbacks, realizes that it means doing your best. 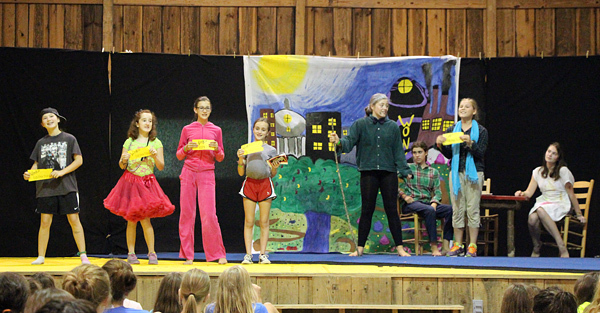 The kids at camp had a great time producing the play and performing it for the entire camp. Even a few parents of the cast members attended the performance. It was a really cute show. 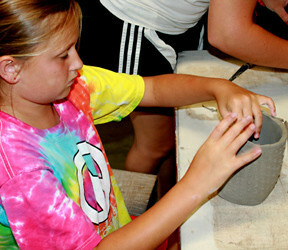 Another great thing about being at summer camp is all the opportunities for creativity you can find. Take Drama for example. This is a chance to really exercise your imagination, perhaps take on a new character, find yourself in an unusual setting or situation. A drama camp means learning a few things about movement and body language, how to improvise, and even how to speak with a certain accent. 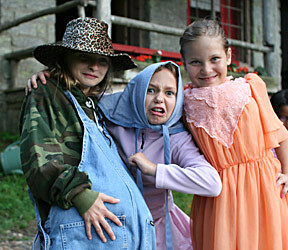 Throw costumes, make up, music and dance in there, and you can see why the Rockbrook Camp drama activity has been so popular (fun!) over the years. Can you tell what these girls are doing? Does it look “dramatic?” Do they seem to be “acting” with “feeling?” Maybe they’re in a “play?” Those certainly are intense “expressions.” Their posture really tells a story. 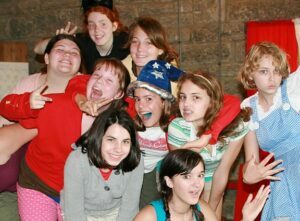 That’s right it’s girls from the Rockbrook camp Drama activity! All the performing, the impersonating, the charades, the improvisation, the comedy and the emotions of a scene— signing up for Drama is great fun. It can be kind of silly at times, but that’s part of camp too. P.S. That’s the Junior Lodge fireplace in the background of this photo. Giraffes, Penguins and Alligators, Oh My! 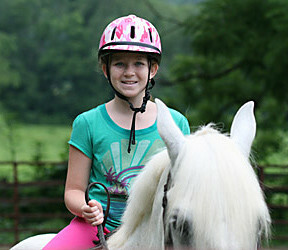 Hey, it’s Lexie reporting to you directly from the Middler line… and beyond! Many girls held their breath this morning as they nervously climbed the steps of the Dining Hall. The cast list for our play, The Wizard of Oz, had just gone up and everyone was anxious to see. The initial craze of shouts and laughter has died down since breakfast and the girls picked up their scripts at dinner from our director, Elise. Now all they have to do is memorize their lines and attend a few rehearsals, and we’ll have our play ready on Saturday, July 21st, for any and all parents who wish to attend. Good luck, girls! Apart from the excitement of the play, we all dressed up in our hairiest costumes for Animal Dinner! We had everything from elephants to bears to flamingos dining together in harmony. I think I saw a lion stalking a zebra, but there are no fatalities to report. 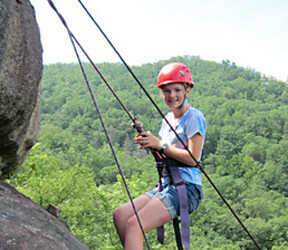 Stay tuned for more intense eyewitness accounts brought to you from Rockbrook Camp! 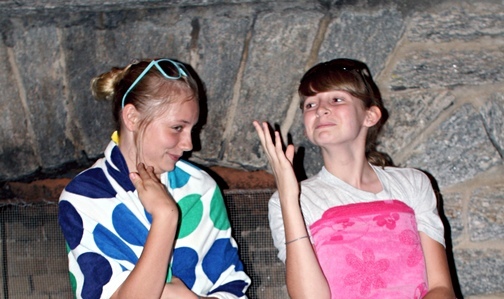 Drama has always been a popular activity at Rockbrook. 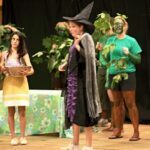 Throughout the week, the drama activity periods involve improvisation situations, puppet shows, charades, and other games, but during each main session the campers and drama instructors also produce a full-blown play. 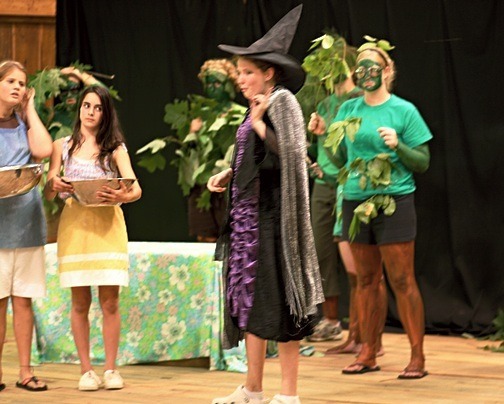 Costumes, scenery, music, choreography, and of course characters presenting a story— it’s an elaborate production performed for the whole camp at the end of the session. 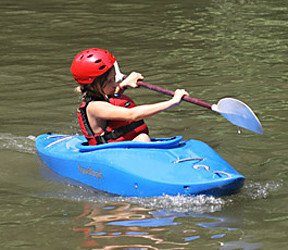 The camp play brings together so many different campers and staff members, all in a cooperative and noncompetitive spirit. It’s a wonderful example of our kids camp philosophy, a great opportunity to create something together, and for all of us to marvel at the results. P.S. 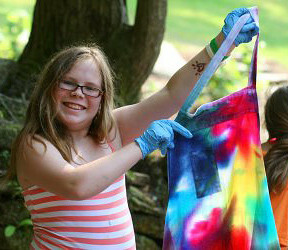 This photo is from last summer’s production of Alice in Wonderland.